A golden glow fills the lounge at the Rifflin'Hitch Lodge in Southern Labrador where guests come to enjoy the quietness after a day of fishing in the river. Everything in the lounge at this fishing lodge is adorned in wood with large windows that look out over the wilderness scenery of the Eagle River. 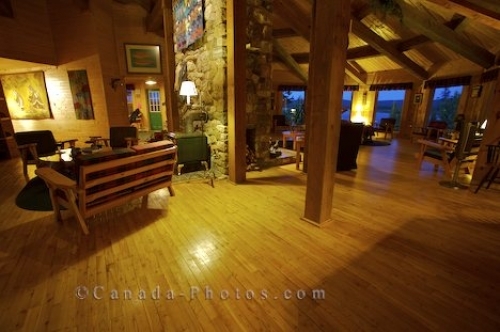 Picture of the beauty of the lounge area at the Rifflin'Hitch Fishing Lodge in Southern Labrador, Canada.